Volkswagen pushes forward the development of fully or partially electrically powered vehicles. Volkswagen plans to launch seven new electric and plug-in hybrid models on the Chinese market in the next three to four years. Each of these vehicles will also be made in China. In addition to this, a new design and development centre in China is also planned. The new models presented in Beijing demonstrate the assertiveness with which Volkswagen is reinventing mobility. The highlight is the debut, a true world premiere, of the T-Prime Concept GTE – the concept of a cutting-edge premium class SUV. 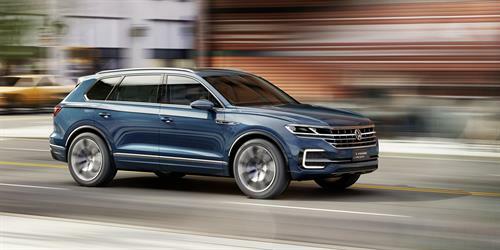 This plug-in hybrid all-rounder gives a first glimpse of Volkswagen’s future flagship. The all-new Magotan was already presented as a world premiere at the Volkswagen Group Night on the eve of the show, accompanied by Volkswagen’s new PHIDEON luxury saloon and the zero-emission MPV BUDD-e, which made their Asian debut at the event. The T-Prime Concept GTE concept car is a premium class sport utility vehicle. With plug-in hybrid and all-wheel drive as well as zero emissions on any terrain, the concept car makes an automotive statement of a new era. The display and control concept are completely digital, the conventional switches in the interior have been done away with and replaced by gesture and voice control, touchscreens and touch-sensitive surfaces. The T-Prime is the world’s first car to feature a Curved Interaction Area – a curved infotainment display that blends in with the remaining displays and controls in the futuristic cockpit. The concept car’s eight-speed automatic transmission is controlled intuitively ‘by wire’ using a glass scroll wheel. The completely newly-developed Magotan will be launched in July. This saloon car is the first vehicle to be based on the modular transverse matrix (MQB). The PHIDEO Nisa new premium class saloon. This Volkswagen, which is around five metres long, will be launched in China in the third quarter of 2016. The BUDD-e is based on a new technology matrix for electric vehicles, the Modular Electric Drive Kit (MEB). Range: up to 533 km (NEDC).The battery can be 80% recharged within 30 minutes.